Idle Hands, the “Bourbon, Beer & Rock” bar that has been in the basement of 25 Avenue B for the past few years will be taking over the upstairs bar with was previously Station B. Word has it that it’ll be pretty much business as usual with the upstairs having the same excellent selection of whiskey & bourbon as well as serving serving food (the menu will be slightly revamped). 4 of the 6 tap beers that they had downstairs will be available upstairs & there are some rumors that downstairs might turn into an event/party space (fans of the Wednesday night beer tastings will be happy to hear this). The space (formerly Save The Robots, Guernica & Club Midway) was rather famously torn to shreds by The Village Voice’s Robert Siestema in May of 2011 and reinvented itself as a less-douchey Station B. Honestly, I think this is a good thing for the neighborhood. 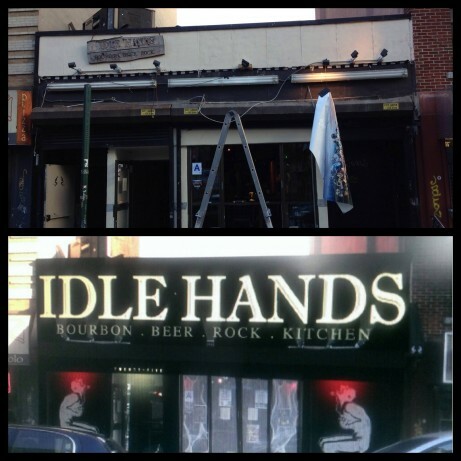 Idle Hands will be open & showing NFL games this Sunday.